The main idea for our design proposal is space adaptability. We wanted to provide the option to constantly change the item display layout, by proposing a wood panel that acts as a support for the movable shelves. The ash wood shelves and have three different dimensions that allow them to be placed anywhere on the perforated plywood wall. The proposed dimensions for the shelves are 35x55cm, 35x35cm and 5x5x55 cm that will be fixed within the perforated wood panel (5x5cm holes dimension). The design allows the shelves to be placed individually or in groups, depending on the current collection and the number of required elements to be displayed. We wanted to give the possibility to have a wider display area for multiple objects, if necessary, or to showcase only one product by placing it apart from the rest of the collection, when desired. Since the walls can not bear too much weight, the wood panel will have a metallic structure that will be fixed on the concrete slabs. The same wood panel will be hung from the ceiling, in order to keep a unitary design. Instead of having small wood beams coming out of the perforated wall, spotlights will be placed into the wall perforations. We also proposed in front of the other wall vertical ash wood elements with a square section of 10x10 cm that come in three different height dimensions: 120 cm, 130 cm and 140 cm. Those elements sustain the adaptability of the space by having the possibility to be easily screwed on the floor. The vertical sticks can be also placed and grouped as desired. 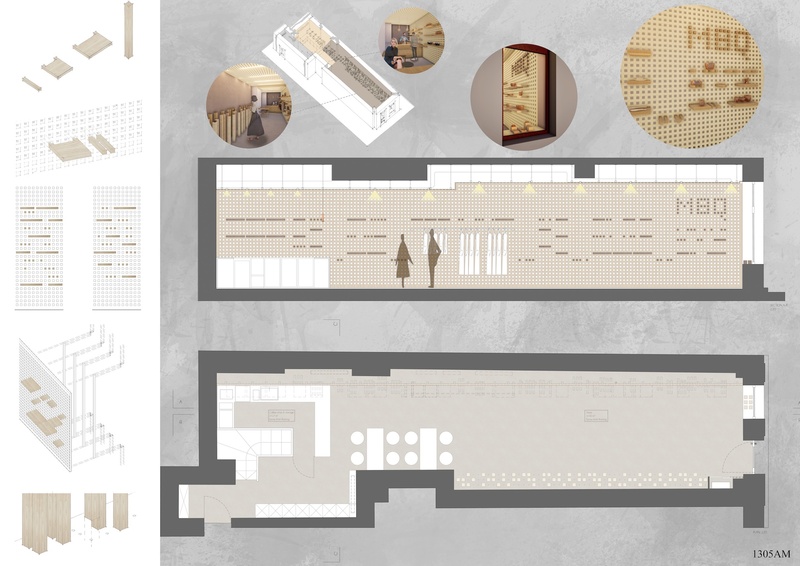 All the proposed elements for the exhibition area provide the quality of having a store that will constantly change its design. Regarding the finishes, we proposed an epoxy resin flooring and micro cement wall finishing that reminds of craftsmanship and vernacular design. 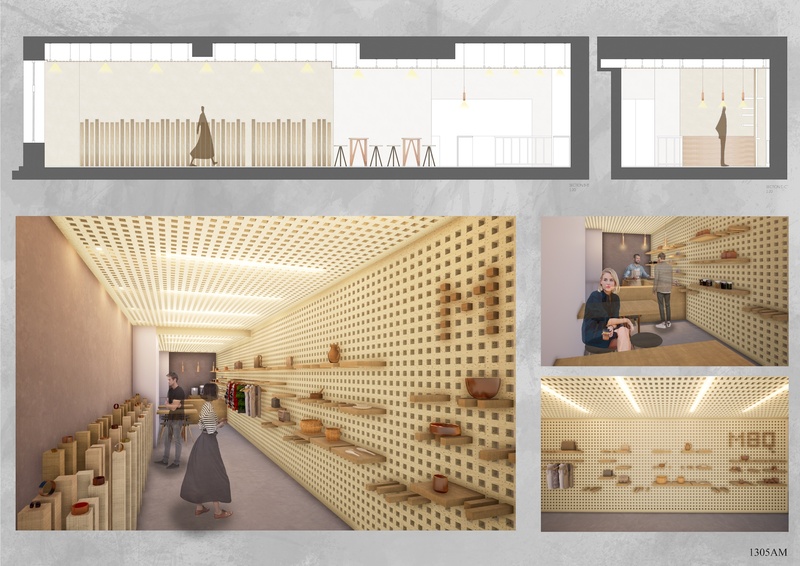 A rough texture will be found behind the bar and on the wall behind the vertical wood display elements, in order to accentuate the main areas of the store. For the social interaction area, we proposed 2 oak wood bar tables hosting a total number of 8 people and can be moved during the events and workshops. We integrated 8 designer chairs, that allow the store to promote local artists and designers. By combining materials that remind of local craftsmanship with adaptability of the design, we hope to provide the quality of a store that keeps on changing its design in order to announce the new collections, keeping the visitor always entertained and curious and, at the same time, sustain the traditional character of the merchandised products.